In this article I will share to you the methods I used in buck converter duty cycle derivation. We will consider the ideal and the real scenarios. 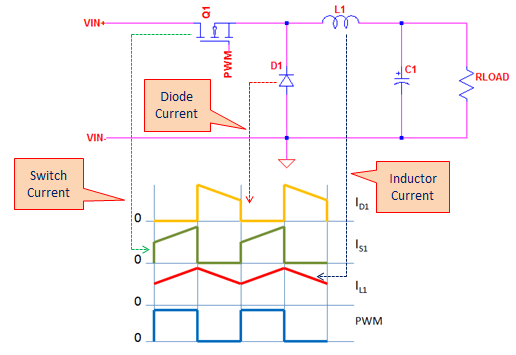 In ideal buck converter duty cycle derivation, you don’t need to consider the voltage drops of the switching element and catch diode. On the other hand, in real buck converter duty cycle derivation, the voltage drops are taken into account. Below is a typical buck converter circuit diagram. In a conventional buck converter the PWM is applied to the switching device which is an N-channel MOSFET in the figure below. Below are the current waveforms of a buck converter. These include the MOSFET current in green, diode current in yellow and the inductor current in red. The bottom waveform in blue is the PWM signal. 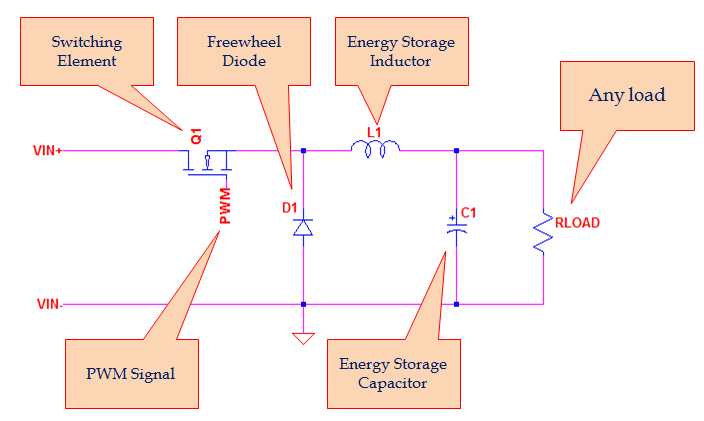 I will discuss here two ways of formulating the duty cycle of a buck converter. The first one is to use the inductor voltage/current equation then do integration. The second one is to use volt-second balance method. Actually buck converter duty cycle and currents are all can be derived from its waveform. Thus it is very important to know the waveforms. Below are the waveforms of buck converter currents operating in CCM. Now, let’s start to derive the buck converter duty cycle using the inductor current waveform above. This is very important. This buck converter duty cycle derivation is only valid for operation in CCM and boundary mode. For DCM, this must not be used. When the PWM signal is high, the inductor current will ramp up linearly as above waveform. When the PWM signal is low, the inductor current will decay in a linear fashion. So, the level of the current rise and current decay is the same. For a pulse or a PWM signal, the time the logic is high (Ton) divided by the period (Tsw) is called the duty cycle. The final stage of this buck converter duty cycle derivation is to equate the inductor rise and decay currents derived above. This approach is actually a short cut to the previous method. This concept makes use of the product of inductor voltage and time. The product of the inductor voltage during PWM high and Ton is equal to the product of the inductor voltage during PWM low or Toff as below figure shows. 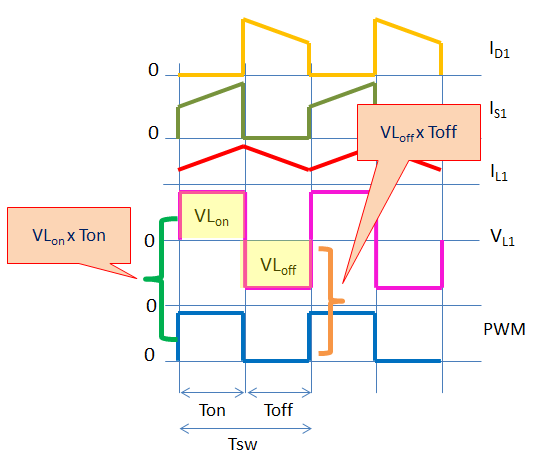 The inductor voltages during Ton and Toff are given below as derived in the first method. The result is very the same to the previous method. Buck converter duty cycle derivation is can be done through the inductor current waveform and then perform integration. This is the long method. To get the duty cycle, the inductor current linear ramp and decay will be equated. This technique is very fundamental and requires great analytical skills. However, once you master this out, you can derive duty cycles of any topology. Another technique that can be used for Buck converter duty cycle derivation is using volt-second method. Actually this is a short cut on the fundamental approach and somehow derived from it. Whichever method you will use will give you the same result.